I was looking for a watercolour to show you, since my painting performance is still under-functioning, when I came across this one. My friend, responding to my request for dance movements to photograph, delighted me by performing flamenco, a discipline she knew well. I was also lucky enough to attend the class she attended, so I have a wealth of images both of single dancers and of groups. This particular dance contained a number of still poses where only the feet were in motion. 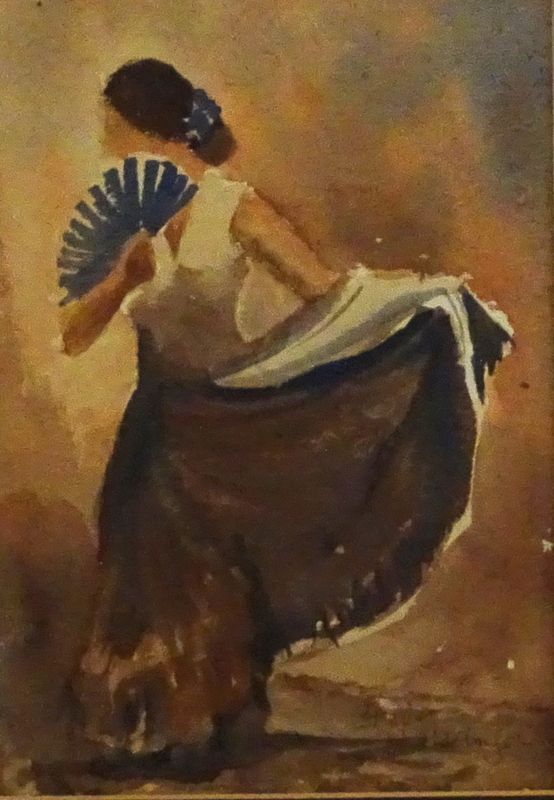 Just two colours were used to create the image, Ultramarine Blue and Burnt Sienna, quite enough to mirror the concentration of the dancer. I began by making a light outline sketch to isolate the shape, then wet the background only, flooding it with blues and browns. Thus the highlights became immediately apparent as I worked on the figure. A pale Burnt Sienna sufficed for the face and arms, shadow touched in while the paint was still damp. Using that shadow tint, the lower bodice and skirt were indicated, the rich deep mix of my chosen colours added wet in wet following the sweep of the material, and the shape of the hair. When all was dry, Ultramarine Blue gave me the fan and the flower in her hair. It’s good sometimes to contemplate past achievements! I’ve always loved this one – full of movement, in spite of the restricted palette! I can hear the feet drumming. Rediscovery of something good is always a pleasure.